With the largest gaming platform, a huge list of age appropriate apps, and an easy to use touch screen, the iPod Touch is a great device for older users and the youth alike. The iPod Touch also has access to an unrestricted Internet, mature oriented apps, and social networking tools that may not be right for younger users. To prevent younger children from viewing inappropriate content, you can use iPod Touch parental controls to restrict how the device is used, or whether it's used at all. Here is a look at how to set the right restrictions to prevent inappropriate use of the device. The primary iPod Touch parental controls are going to be around the Restrictions, which prevent the use of certain types of apps, content or access. To set these, start by going to the general iPod Touch Settings. Go into General and then go down to Restrictions, which is directly below Passcode Lock. When you are in, you start by tapping Enable Restrictions, which will let you then set a four-digit passcode. This is the passcode you will have to enter when you try to alter or remove the Restrictions. Once you have enabled them you will have several blocks of options. 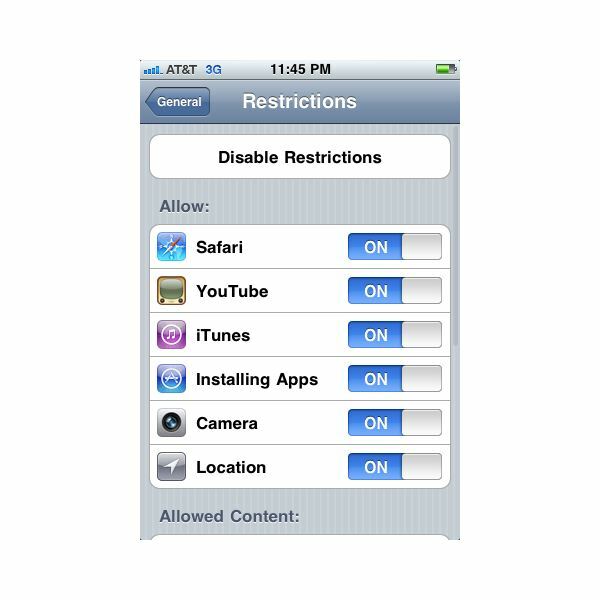 First, you will have On/Off switches to allow or disallow use of the Safari, YouTube and iTunes apps. You will also be able to turn on and off access to Installing Apps/Deleting Apps. Below that will be to allow changes to be made to either Camera or Location. The remaining content will be things that are specifically on your iPod, and not broad to all iPod Touch devices. You can then turn off In-App Purchases, which means money you can spend from within a game or app. These present a lot of issues for younger players since they do not go through the normal iTunes security process. You will also be able to set the rating for the United States, choose if you want to turn off access to music and podcasts that are labeled as Explicit, turn off access to movies altogether or by rating, TV shows by rating, or apps by their age level. This is the most specific of all the iPod Touch parental controls since it will let you determine what is appropriate for your child based on ratings. At the very bottom you have Game Center controls and you can turn off either multiplayer games or adding friends, which can give them unrestricted access to social networking tools. people are forced to enter when they try to get into the device. Start by selecting Passcode Lock inside the General Settings and then select Turn Passcode On, which will ask you to set a passcode. This can be a ten digit passcode or a Simple Passcode, which is four numeric digits. You can choose to change the passcode to another option, and if you want the Simple Passcode then you will have to change the appropriate switch to On. You have the option to choose when to require the passcode, and you can select to either require it immediately or by different time increments ranging from one minute to four hours. Additionally, you can set the Erase Data switch to On if you want the iPod to delete all content if the passcode is entered incorrectly ten times. If you want to turn the passcode back off, you will simply have to return to the Passcode Lock option in the settings, enter the passcode, and then choose the Turn Passcode Off button. 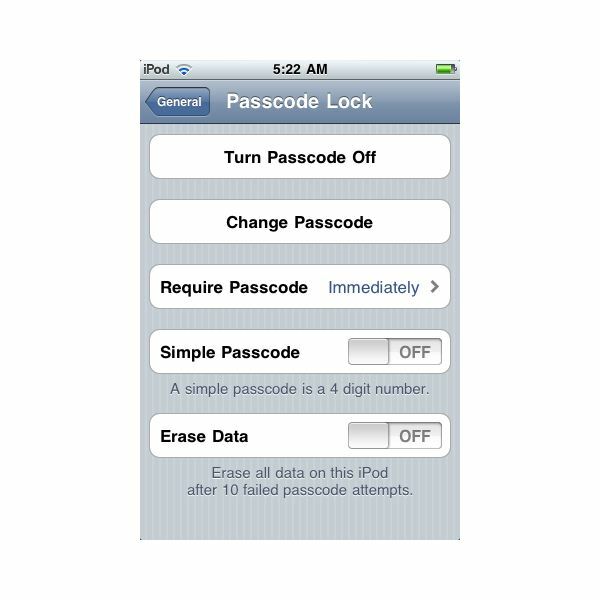 If you want the Passcode Lock to be successful, you will need to set an appropriate Auto Lock to match it. The Auto Lock determines how long before the iPod Touch can just sit there before going to the original lock screen, where you will now need to enter the passcode. When you go into General Settings you will find the Auto Lock option above Passcode Lock, and when you go in you will have options for minutes ranging from one to five or to just forgo the Auto Lock altogether. You want to make sure that you return the Auto Lock time to one or two minutes since this is going to eliminate most of the time that would normally give a child access to the device without actually entering in the appropriate passcode. The restrictions and passcode are going to give you several ways to dictate how the device is used, but they are absolute in their approach and will not allow for wiggle room. You may want to instead take a closer look at what your child uses on the iPod and make fewer restrictions, though those that restrict in app purchases and pricey downloads can be a good option. The financials of using the App Store can always be tricky, and the App Store app will give access for a lot of downloads to anyone with a password. Article written based on author’s own experience.